Indonesia currently has 33 provinces. Each province has its own local government, headed by a governor, and its own legislative body. POS Indonesia issued three sets of 11 stamps in 2008, 2009 and 2010 illustrating the emblems of each of the 33 Indonesian Provinces. The two stamps, of the 2010 series (issue date: 13 December), on this nice cover from Malang feature the emblems of the provinces of Jambi (top right) and of Bangka Belitung Islands (top left), both located in the West of the Indonesian archipelago. 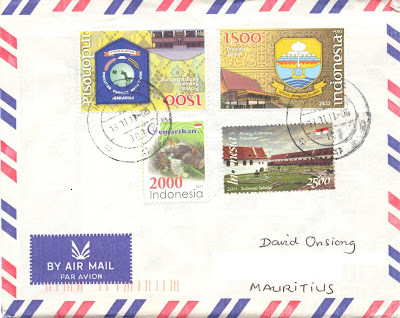 The two other stamps are from the 2011 Fish Consumption Promotion Movement set (Rp2000) and the Landmark set (Rp 2500), the last stamp showing Fort Rotterdam in Makasar City, South Sulawesi.